Young Monks and Culture Monks are very happy to introduce to Kolkata , a workshop on electronic music to be conducted by Varun Desai. 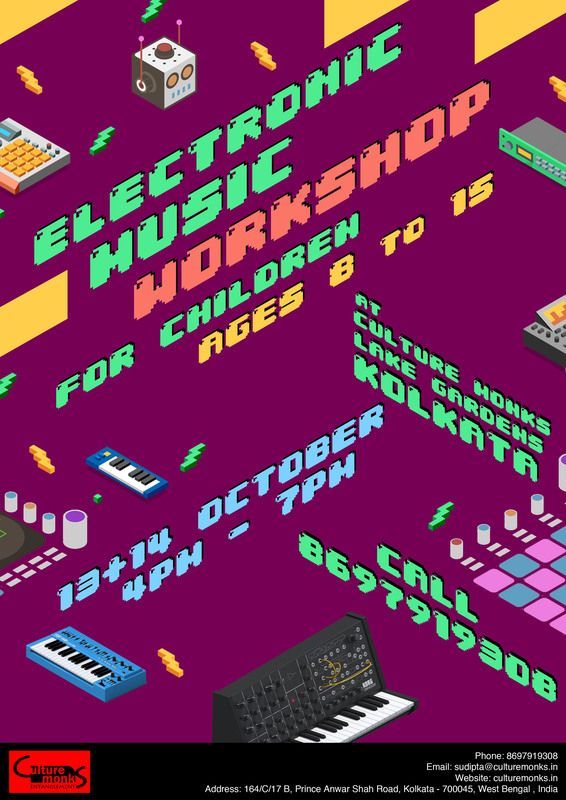 This workshop will introduce children to the world of electronic music and help them to create sound tracks which will be a signature of their childhood – a priceless memory they will have for a lifetime. The participants need to come with their notebook. We will provide the rest of the equipment. A 2 day workshop to introduce children to the world of electronic music. They will begin by learning the basic physics of sound using an interactive audio-visual process. We will then dive into the world of synthesisers and electronics with a hands on learning experience to understand the different nuances of electronic music instruments. The children will be introduced to the concept of a studio and learn how music is made in this modern day era. The workshop will culminate in live sessions where the children get to make music and record their own songs to take home! Varun is a computer engineer and musician. Discovering electronic music in the mid-90s in India, his habit of compiling and manipulating sounds led to a DJ career under several aliases. Gigging extensively in the US, he formed a DJ collective with DJ Damon from Poland in 2005. Later years were spent managing a record label (DBR) and organising events around the United States. After performing at the Burning Man Festival in 2008, Varun returned to his hometown, Kolkata. Next Lake Gardens chapter is starting ! !